Ras al-Khaimah (alternatively Ra'sal-Khaymah or Ras el-Kheima; Arabic: رأس الخيمة‎‎; [raʔs alˈxajma]) is one of the seven emirates that make up the United Arab Emirates (UAE). The current statehood is the result of the 1909 appanage from Sharjah. Its name could be taken to mean "headland of the small huts", which can be attributed to the indigenous buildings that existed along the coast. The emirate is in the northern part of the UAE, bordering Oman's exclave of Musandam. It covers an area of 1,684 square km. The capital city and home of most residents is also called Ras Al Khaimah. The emirate had a population of 210,063 at the 2005 Census, of which 41.82 percent or 87,848 were Emirati citizens. Latest estimates put the total population at between 250,000 and 300,000. Locals accounted for 97,529 in the population estimate for 2010. The city has two main sections, Old Ras Al Khaimah and Nakheel, on either side of a creek. It is served by the Ras Al Khaimah International Airport. It consists of a northern part (where the city of Ras al-Khaimah is situated), and a large inland exclave in the south (near Hatta), and a few small islands in the Persian Gulf. Ras al-Khaimah has the most fertile soil in the country, due to a larger share in rainfall and underground water streams from Omani mountains. Ras al-Khaimah has been the site of human habitation for several millennia and there are many historical and archaeological sites throughout the emirate - local sources cite 1,000 - dating from different time periods, including remnants of the Umm an-Nar Culture (3rd millennium BC). Ancient graves were found in the Emirate in October 2012. The city was historically known as Julfar. According to Sheikh Sultan bin Muhammad Al-Qasimi, current ruler of Sharjah Emirate, the city of Ras al-Khaimah (which before was the capital of the state that is now Sharjah) was historically known as Julfar and was founded by Armenians who escaped Persia during the Mongol invasion. Further, archaeological evidence has demonstrated that the settlement known as Julfar shifted location over time as harbour channels silted up. Excavations of a sizable tell, which revealed remnants of a Sassanid era fortification, indicate that early Julfar was located in the north of Ras Al-Khaimah, not far from other sites of historical/archaeological interest such as 'Sheba's Palace' and the largest Umm an-Nar tombs found on the Arabian Peninsula. Sources say that Julfar was inhabited by the Azd (a branch of the Kahlan tribe) during the eighth and ninth centuries AD, and that the houses of the Azd were built of wood. There is considerable debate locally regarding the 18th-century charge of maritime piracy, attracting the British label 'The Pirate Coast' to the Eastern Gulf before a series of treaties in 1820, 1853 and, in 1892, the Perpetual Maritime Truce led to it being known as the 'Trucial Coast'. In the early 18th century, the Al Qasimi dynasty established itself in Ras Al Khaimah and Sharjah on the Arabian Peninsula, growing to become a significant maritime force with holdings on both the Persian and Arabian coasts. In 1819, a British naval force was sent from Bombay in order to suppress alleged piracy - actions of the Al Qasimi fleet against British flagged shipping that affected trade routes in the Strait of Hormuz, along the Persian Gulf coast, and the Indian Ocean. In the Battle of Ras Al Khaimah of 1809, the Al Qasimi fleet was largely destroyed. The British operation continued to Linga on the Persian coast which was, like the Greater and Lesser Tunbs islands, administered by the Al Qasimi. 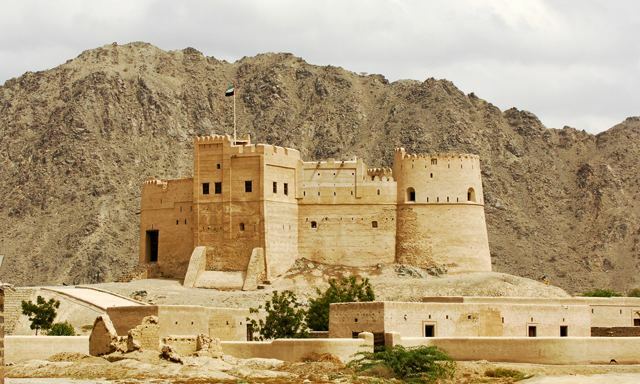 The attack on Ras Al Khaimah resulted in the destruction of the tower of the 16th century Dhayah Fort whose remains can be seen at Rams in northern Ras Al Khaimah. In January 1820, the British imposed the General Maritime Treaty of 1820 signed by Sheikh Sultan Bin Saqr Al Qasimi who was reinstated by the British in Ras Al Khaimah after the deposition of Hasan Bin Rahma. The treaty stipulated the end of piracy and slavery, and laid the foundation for the British protectorate over the Trucial States that lasted until 1971. In 1869, Ras Al Khaimah became fully independent from neighbouring Sharjah. However, from September 1900 to 7 July 1921, it was re-incorporated into Sharjah; the last governor became its next independent ruler. On 10 February 1972, Ras al-Khaimah, under the leadership of Sheikh Saqr bin Mohammad al-Qasimi, joined the United Arab Emirates. 1814–1820: Sheikh Hasan bin Rahma. In 1919 shifted capital to Khatt due to British burning. Signed General Maritime Treaty of 1820. 1820–1866: Sheikh Sultan Bin Saqr Al Qasimi (2nd time). In 1820 shifted capital to Sharjah. 1866 – May 1867: Sheikh Ibrahim bin Sultan Al Qasimi. Ruler of RAK. May 1867 – 14 April 1868: Sheikh Khalid bin Sultan Al Qasimi (died 1868). Ruler of RAK. 14 April 1868 – 1869: Sheikh Salim bin Sultan Al Qasimi (18??–1919). Ruler of Sharjah and RAK. 1869 – August 1900: Sheikh Humayd bin Abdullah Al Qasimi (died 1900). Ruler of RAK. 1909 – August 1919: Sheikh Salim bin Sultan Al Qasimi. Governor of RAK, declared independence (against Sharjah) 1912. The appointed heir presumptive is currently Muhammad bin Saud al Qasimi, son of the current Ruler of the Emirate. In 1975, the total population of Ras Al Khaimah was 43,845 of which 29,613 were nationals and 14,232 were foreigners. This figure increased to 73,918 (39,148 locals; 34,770 foreigners) in 1980, 96,578 in 1985, 143,334 in 1995, and 210,063 in 2005. The current total population is estimated to be between 250,000 and 300,000 people, nationals and foreigners. Ras al-Khaimah's desert climate (Köppen climate classification BWh) is hot and arid with very hot summers and mild winters. The average temperature is 18 to 25 °C (64 to 77 °F) in January and 29 to 43 °C (84 to 109 °F) in July. However, temperatures often reach 45 °C in the summer; the highest recorded temperature is 48.8 °C (119.8 °F). The humidity is usually high in the summer months. Rains and thunderstorms occur rarely, and only in winter. Snow has been reported in December 2004, January 2009 and February 2017 in the high mountains of Ras al-Khaimah. Temperatures as low as -3 °C have been measured at the peak of Jebel Jais. Not being a producer of oil, Ras al-Khaimah has focused on developing its industrial sector. As of 1920, Ras al-Khaimah was mining iron ore.
Real Estate – numerous residential areas, offices, commercial buildings are constructed in Ras al-Khaimah. Tourism – Ras al-Khaimah is becoming a new destination on tourist maps. Ras al-Khaimah is home to five star hotels and beach resorts including Hilton Hotels and Resorts, Rotana or Banyan Tree. It has a number of 4 and 3 star accommodations. In September 2010, first water park Ice Land was opened to offer leisure opportunity for both residents and visitors and more new tourism projects are under construction. Building materials – Ras al-Khaimah opened the UAE's first cement company in the early 1970s and is now the UAE's largest producer of cement. In the 1980s, the emirate formed Ras al-Khaimah Ceramics, which has become one of the world's largest ceramics producers. Manufacturing and High-Tech Industry – In the 1980s, the emirate formed Gulf Pharmaceutical Industries (Julphar), the Persian Gulf region's first pharmaceuticals company. Falcon Technologies International (FTI) represents high-tech industry and produces optical storage media (CDR,DVDR, BDR). In 2012, Innovative Composite Engineering was established in the Industrial Free-zone to manufacture high end composite products (aerospace, construction parts). Service sector – recently growing sector with its prominent RAK Bank and RAK Insurance companies. Agriculture and Fisheries – in the past, these were the main economy sectors of Ras al-Khaimah. Nowadays they are still significant providing foodstuff not only for the Emirate but for the whole country. New legislation and regulations favour international investments. The combination of security and confidentiality is ensured to entrepreneurs. An international company may only have foreign customers and is not liable for paying local taxes. It can open a local bank account, make investments tax-free, and obtain mortgages for investing in UAE assets. Employment visas are available. When approved, this type of company can own property in UAE free-trade zones. No income, sales, or wealth taxes are payable by individuals. No corporate taxes are charged. In addition, there are no exchange controls, no withholding nor import or export taxes. The UAE culture mainly revolves around the religion of Islam and traditional Arab culture. The influence of Islamic and Arab culture on its architecture, music, attire, cuisine and lifestyle are very prominent as well. Five times every day, Muslims are called to prayer from the minarets of mosques which are scattered around the country. Since 2006, the weekend has been Friday-Saturday, as a compromise between Friday's holiness to Muslims and the Western weekend of Saturday-Sunday. It should be noted however that a great majority of the population are non national citizens, coming from India, Pakistan, and a wide range of nations. The annual Ras al-Khaimah Half Marathon, first held in 2007, has called the attention of the world's sporting media to the region. The organisers invest much in the IAAF-labeled race in order to attract the world's top athletes, resulting in a world record from Samuel Wanjiru in 2007 and the second fastest run of all-time from Patrick Makau Musyoki in 2009. UAE Awafi Festival – a yearly festival in the Ras al-Khaimah desert, focusing mainly on the Arabic public. It is a three-week event, held in December or January, the main attraction being a dramatic sand dune race by the strongest 4-wheel drivers of the UAE. There is a heritage village with traditional food and dance, as well as shops for food and souvenirs. There is also a petting zoo and lots of games for children. The entry is free of charge, and many families bring picnics to enjoy whilst watching the cars battling it out over the sand dunes. Terry Fox Run RAK – a yearly charity run organized in Ras al-Khaimah to support cancer research in the UAE. The first event was organized in 2010 (short movie from 1st RAKTFR event). Participation of this event has grown from hundreds to thousands since its inception. Within Ras al-Khaimah city, the main mode of transport are metered taxis, with public buses operating on long-haul routes and catering mainly to smaller towns (e.g. Sha`am, Ar-Rams, and Al Jazirah Al Hamra). A local bus service operated by RAK Transport Authority provides infrequent connections between Nakheel, Al Hamra and the airport. Ras al-Khaimah is connected to the other emirates by taxis and buses which embark from the Bus Station located at RAK Transport Authority Headquarters near the new Ras al-Khaimah Police Headquarters and opposite the Cove Rotana hotel. Three dual-carriageways link Ras al-Khaimah with the other emirates and beyond. One follows the coast with beaches on one side and stretches of desert on the other; the other, a new route, runs out towards the airport in the direction of Khatt, Masafi, Fujairah, Dhaid, and eventually Oman. The Emirates Road (E311 Highway) traverses the emirates of Umm Al Quwain, Ajman (for 60 km (37 mi) of its length) and Sharjah (for 71 km (44 mi) of its length) to finally end up in Dubai (for 87 km (54 mi) of its length). The highway allows journeys from Ras al-Khaimah to Dubai in under 45 minutes. The highway is being extended further till Saqr Port to allow direct flow of traffic from the southern emirates, the extension was scheduled to be completed by 2014. In spring 2013 work on the 32-kilometre (20 mi) RAK Ring Road which will bypass the city and connect the quarries and factories of the north coast with the 311 motorway was held up by a three-month rescue excavation after the discovery of megalithic tombs dating to the Wadi Suq period, from 2000 to 1600 BC. Saqr Port, located in the industrial area of Khawr Khuwayr, is the emirate's main port, providing bulk and container services. It has eight deep-water berths, each 200 m (660 ft) long, is dredged to 12.2 m (40 ft) and has two "ro-ro" ramps plus specialised berths for handling bulk cement and aggregate. Other services include ship-handling, crew changes, and 40,000 m2 (430,000 sq ft) of covered storage, together with a vast open storage area. It is also the closest port in the UAE to Bandar Abbas, Iran, but there is no shipping from Saqr port to Bandar Abbas. Ras Al Khaimah International Airport offers cargo and passenger services to a variety of destinations covering the Middle East, North & East Africa, Central Asia and the Indian Subcontinent. It serves as a hub for low cost carrier Air Arabia. On 17 February 2006, Space Adventures announced its plans to develop a $265 million commercial spaceport in Ras al-Khaimah for space tourism. This plan has yet to be realized. Waldorf Astoria - Ras Al Khaimah: The Middle Eastern venture of the legendary Waldorf Astoria of New York.